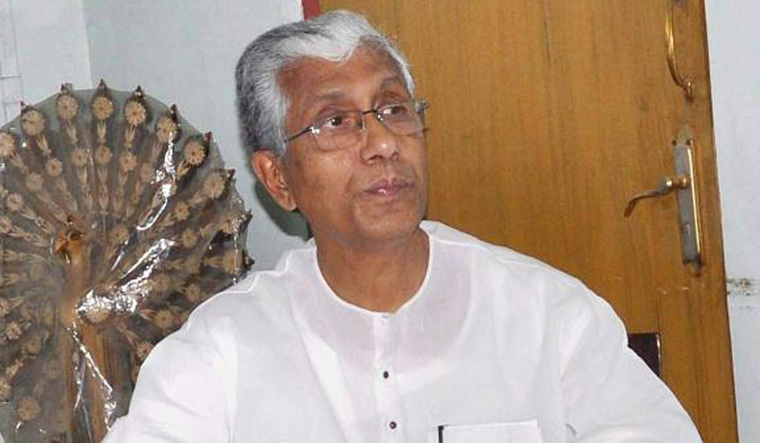 The humble life of Marxist leader Manik Sarkar had been a poll plank of the CPI(M) in Tripura to take on its “luxurious” political opponents. According to an affidavit submitted by the former chief minister along with his nomination paper during the recently held assembly elections, Sarkar's asset was Rs 1,520 as cash in hand and Rs 2,410 in bank account. However, Tripura's longest serving chief minister's pro-poor image took a hit with reports that Sarkar demanded an SUV and a new residence from the newly formed BJP government. In a letter addressed to Tripura legislative assembly secretary Bamdeb Majumder on March 26, the CPI(M) leader has asked for arrangements to be made for a ‘befitting residential quarter’. Sarkar and his wife Panchali Bhattacharya have been staying at the party office since March 8 after the left government was routed by the BJP in Tripura. Bamdeb Majumder confirmed receiving the letter from Sarkar. “Sarkar verbally requested to allot him either an Innova or Scorpio as he is not physically fit to travel in an Ambassador car,” he told a national daily. According to a report in the daily, though Sarkar was offered a Bolero jeep he did not accept it as it was about five years old and had been driven 1.25 lakh km. The ruling BJP and the Congress were quick to slam Sarkar's demand for an SUV, saying it has busted the “myth” surrounding his simplicity. His demands are a blotch on the ideals of communism, said BJP's Mrinal Kanti Dey while Congress spokesperson Tapas Dey said Sarkar has given scope to his critics to question his intentions.